Ships today if you order in the next 10 hours 20 minutes. 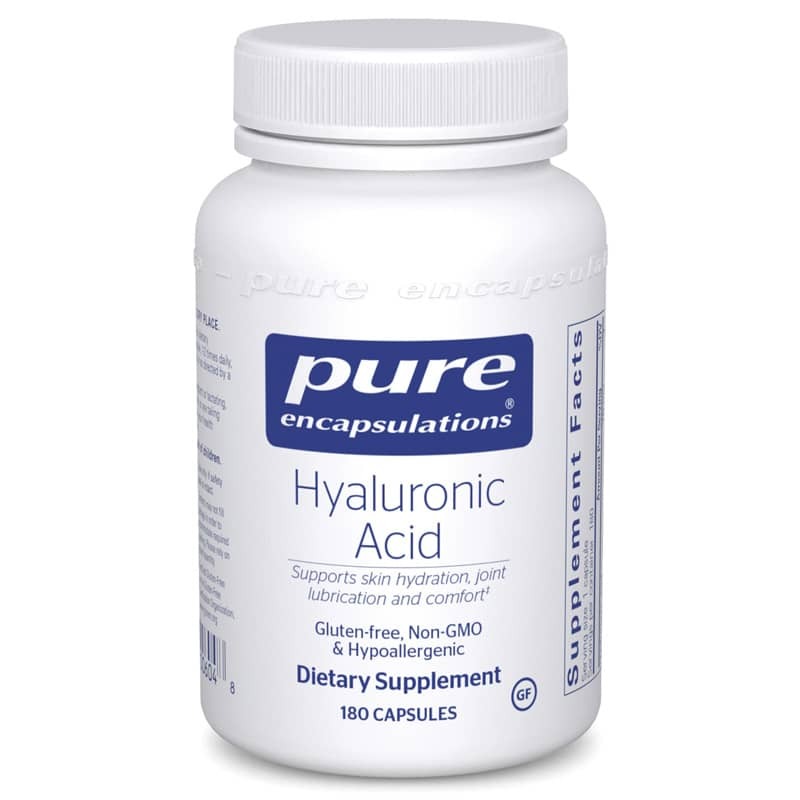 *Hyaluronic acid, or HA, is a naturally occurring polymer found in every tissue of the body. It is particularly concentrated in the skin and in synovial fluid but decreases with aging. Both mechanisms decrease the availability and capability of HA to maintain healthy skin and joints. Some forms of HA consist of large molecular weight compounds ranging in size from 500,000 to 6,000,000 daltons. Because this is too large to be absorbed in the intestines, this specialized form of HA undergoes a sophisticated, patent- pending enzymatic process that alters the molecular weight of the material but not the chemical composition. The final result is an easily absorbed HA polymer with a molecular weight of 5,000 daltons. This polymers functions include attracting and retaining water in the extracellular matrix of tissues. For skin cells, this is essential for proper cell-to-cell communication, hydration, nutrient delivery, and waste and toxin elimination. HA also appears to support the skin by promoting healthy turnover and renewal of keratinocytes, moderating the appearance of fine lines and age spots. For joints, HA is especially supportive of healthy lubrication and shock absorption. Furthermore, in vitro studies indicate that HA modulates prostaglandin production, providing additional support for joint function. In an animal study, low molecular weight HA demonstrated the ability to be absorbed orally. Subjective evaluations conducted by scientists at a Japanese university involved 96 individuals. The reports suggest an enhancement of skin and joint health using low molecular weight HA. A number of anecdotal and preliminary results also indicate a positive effect on skin and joint health. Adults: As a dietary supplement, take 1-2 capsules per day, in divided doses, with or between meals.